Some of the most beautiful features of this church are its unique stained glass windows, made in Brighton, England, by the firm of Barton, Kinder, and Alderson. All of the blue/green-bordered windows contain (in the border) pieces of glass salvaged from churches in southeast England destroyed by enemy bombing raids during World War II. Some of this glass dates back to the 12th century, and in our window borders one may see a fragment of a hand, foot, forehead, etc., that had graced another church. In the descriptions which follow, the source of the glass is noted with the approximate construction date of the church from which it was salvaged. The ST. PETER window (left) contains glass from St. Peter the Great, Chichester, Sussex, 1810. This is in memory of Abraham Skaff, the gift of his family. 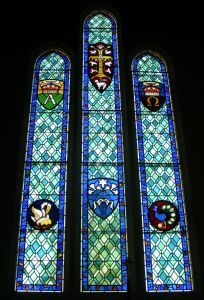 The ST. DAVID window (right), which contains glass from St. Mary's, Ashford, Kent, a church associated with Tudor Queen Elizabeth, 1578, is in memory of Arthur J. Hollensworth, 1870-1947, the gift of his family. 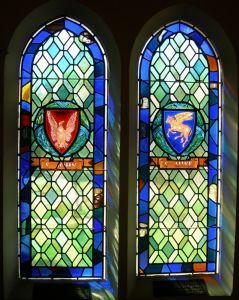 These window, in honor of Saints Andrew and Alban, are the gift of Brooks and Ruth King Hoskins in memory of Maude H. King, 1859-1915, and Lucian A. King, 1857-1935. The glass in the ST. ANDREW window (left) is from St. Andrew's, Deal, Kent, 1850. The glass in the ST. ALBAN window (right) is from St. Peter's, Titchfield, Hants, 1500. The ST. JOHN window (left), with glass from St. John's, Kingsdown, near Dover, Kent, 1850, is the gift of Mr. and Mrs. G. Frederick Lawrence in memory of her brother, Wesley Kenneth Wilson, 1903-1944. 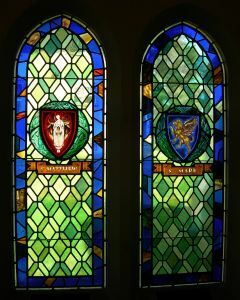 The ST. LUKE window (right) is the gift of Walter and Edward Booth in tribute to their parents, Arthur and Mary Booth, with glass from St. Luke's, Southampton, 1800. 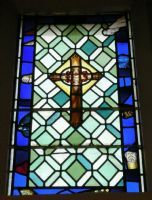 The ST. MATTHEW window (left) is in memory of Addison B. Falconer, 1890-1918, with glass from St. Matthew's, Southampton, 1800. 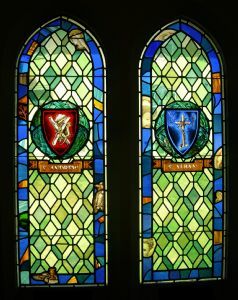 The ST. MARK window (right) is the gift of Col. Robin and Harriette Falconer Day, with glass from St. Mark's, Kensington Oval, London, 1820. This was one of 4 churches built in thanksgiving for the victory at Waterloo. Field Marshall Montgomery was born in this vicarage, his father being the vicar. 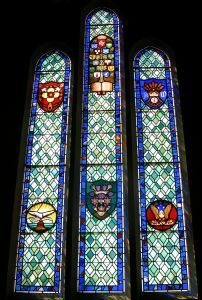 The ST. PAUL window (left) is the gift of Mr. and Mrs. Fred Copelin, with very old glass from All Saints, Hurstmonceaux, Sussex. The original date is unknown, but this church was referred to in the Doomsday Book as a "church of antiquity" and was rebuilt in the 13th century. The village takes its name from Simon de Monceaux, a follower of William the Conqueror. The ST. AIDAN window (right) is in memory of Gilbert and Ella Gilman, the gift of their son, M. B. Gilman, with glass from St. Nicholas, Pevensey, Sussex, built in 1290 on a spot where William the Conquerer stumbled and fell. He decreed a church should be built there. He landed at Pevensey Bay, now known as Norman's Bay. 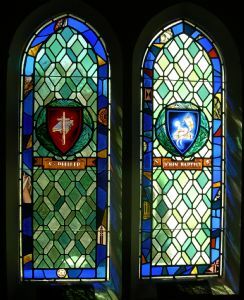 The ST. PHILIP window (left), in memory of Roy Salem Towne, is the gift of Mrs. Alice Williams Towne, Matilda and Salem, with glass from St. Andrew's, Bishopstone, Seaford, Sussex, 1561. The ST. JOHN THE BAPTIST window (right) is in memory of John Bashara, 1881-1933, the gift of his wife and family, with glass from All Saints, Hastings, Sussex, 1553. 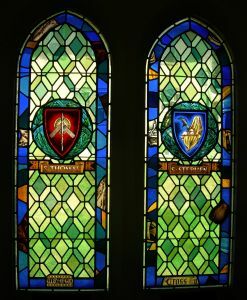 The ST. THOMAS window (left) is in memory of Edward C. Sievert, 1862-1946, the gift of Mr. and Mrs. Stanley Graben, with glass from St. Mary's, Westbere, Canterbury, 1400. The ST. STEVEN window (right) is a tribute to Mrs. Graben's mother, Helen B. Sievert, with glass from St. Bartholomew's, Dover, Kent, 1800. The glass in the ST. JAMES THE GREATERwindow is from All Saints, Brighton, Sussex, 1853. The ST. PATRICK window, containing glass from St. Mary Magdalene, St. Leonard's on the Sea, Sussex, 1850, is in memory of John Nicola, 1914-1944, the gift of his parents, Mr. and Mrs. Sam Nicola. The north transept window depicts the TREE OF THE SEVEN GIFTS OF THE HOLY SPIRIT. 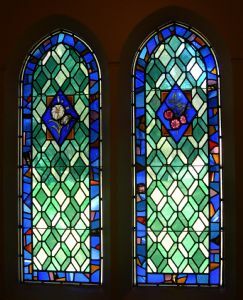 This window memorializes three generations of communicants in St. George's--Miriam Bentley Belk, 1881-1947; Clarice Belk Nelson, 1910-1943; and Emily White Bentley, 1839-1894. It is the gift of J. B. Belk and the Rev. Leonard C. Nelson, with glass from SS Mary Magdalene and Denis, Midhurst, Sussex, 1563. The south transept window is the TREE OF THE TWELVE APOSTLES, with glass from St. Nicholas, Strood, Kent, 1565. It is the gift of Mrs. Edna Dullam in memory of George F. Dullam and a tribute to Harrison and Sarah Lake Dennis, Dakota pioneers. Facing the altar, one sees it flanked by two windows depicting OUR LORD and the VIRGIN MARY. These are the gifts of Gordon and Anne Atkinson Cox in memory of Emma Hilton Atkinson, 1874-1943, and Timothy Ralph Atkinson, 1868-1937. 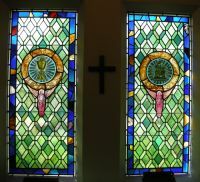 In the sacristy to the south is the window of the PASSION, the gift of a former St. George's rector, the Rev. A. E. Smith, as a tribute to his parents, Albert and Jane Smith, with glass from Millbrook, Southampton, 1870. In the columbarium, the ST. CECILIA window is a tribute to Bjorne and Florence Thorkelson, the gift of their daughters, Dorothea and Daphne, with glass from St. Mary's, Walmer, Kent, 1560. 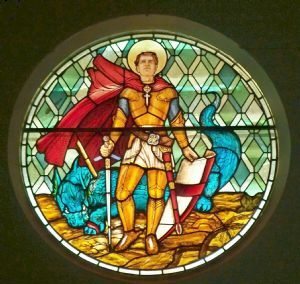 Looking from the sanctuary to look toward the entrance of the church, one sees high in the front gable, framed through an arch, a round window depicting the patron saint of this church, ST. GEORGE, slaying the dragon. This is the gift of Mrs. Harriet Watkins in memory of her parents, Otto Holta, 1866-1949, and Bertha Holta, 1882-1940. 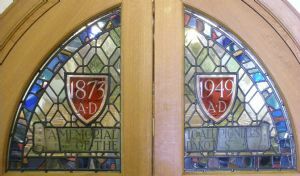 The GREAT SEAL OF NORTH DAKOTA window is the gift of Mrs. Lucille Hall Blunt as a tribute to her father, the Hon. Thomas Hall, Secretary of State (of ND) from 1913-1924 and from 1943-1954, on the occasion of his 80th birthday, June 6, 1919. The glass is from St. Michael's, the oldest church built in Southampton, built in 1124. One enters the nave through wide doors flanked by two beautiful windows. To the south is ST. MICHAEL (left) and on the north is the ANGEL OF PEACE (right), the gifts of Dr. and Mrs. C. W. Schoregge and sons Charles and Robert. The two windows above the stairwell in the narthex had to be returned to England for refashioning because they were the wrong size. One of the windows is the gift of Mrs. Fern Logan in memory of her mother, Mary Gardner Reade, 1855-1920, with glass from East Langdon, Dover, Kent, 1500. The windows below are part of what originally was the Chapel of the Angels, located under the tower. This area is now the church office. 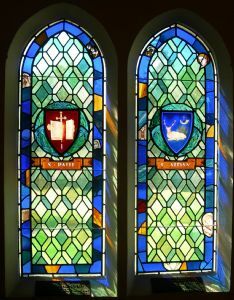 The FISH window (left) is in memory of Leah Bernadette Goldstone, Grafton, N.Dak., 1893-1944, with glass from St. Martin's, Mongeham, Kent, 1685, the gift of her husband, Fred. 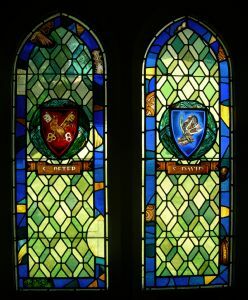 The DOVE window (right) with glass from All Saint's Hospital Chapel, Eastbourne, Sussex, 1850, is the gift of Mrs. John DeFord in memory of her peioneer grandparents, Joseph M. and Ruth Y. Higgs and Joshua M. and Martha A. Corbin. 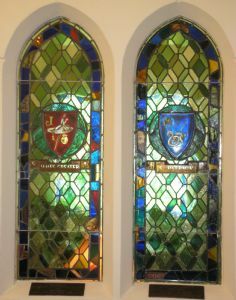 The ANCHOR window (left) is the gift of Dr. and Mrs. W. E. Cole, Lisbon, N.Dak., former communicants of St. George's, with glass from Christ Church, Fairwarp, Sussex, 1881. 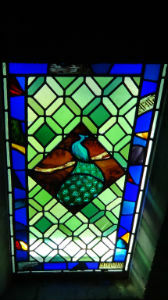 The PHOENIX window (right) is in memory of Beatrice Embertson, LaMoure, N.Dak., 1913-1947, the gift of relatives, with glass from St. Mary's, Lyminister, Sussex, 1566. 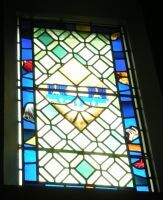 The LAMP window (right) is in memory of Benjamin Frank Tillotson, 1887-1947, the gift of his daughter, Ann, with glass from St. Saviour's, Walmer, Kent, 1800. The CHALICE window (left) is in memory of George Henry Instone, 1877-1946, the gift of his wife and children, with glass from St. Michael's, Highgate, London, 1775. 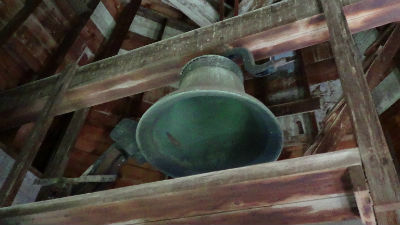 The bell that is in the steeple at St. George’s Episcopal Memorial Church. It was given To The Glory Of God In Loving Memory Of David Pap George 1895-1951. The electric bell ringing system is the gift of the Vane P. George family. 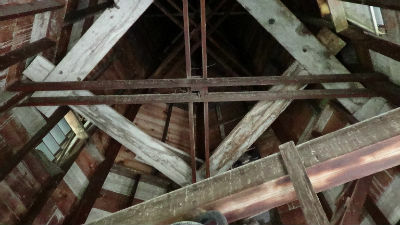 The inside of the bell tower looking straight up from the bell.